The Bees’ Knees. If any cocktail will tempt me, it will be one with a name like this. It promises enjoyment, humour and ultimate pleasure. The sort of allure a cocktail should have. I first came across this delightfully named creation at the bar of Soho’s Quo Vadis club. Since then, I’ve never looked back. Other than its name, the simplicity of this drink is part of its magic. Like most of the best things, it is only as good as what you put into it and in this case, that’s honey, lemon and gin. Talk to any serious honey lover or gin distiller and you will discover how complex the flavours of these ingredients can be. Honey reflects the bees’ environment as much as wine or cheese can be said to describe its terroir. 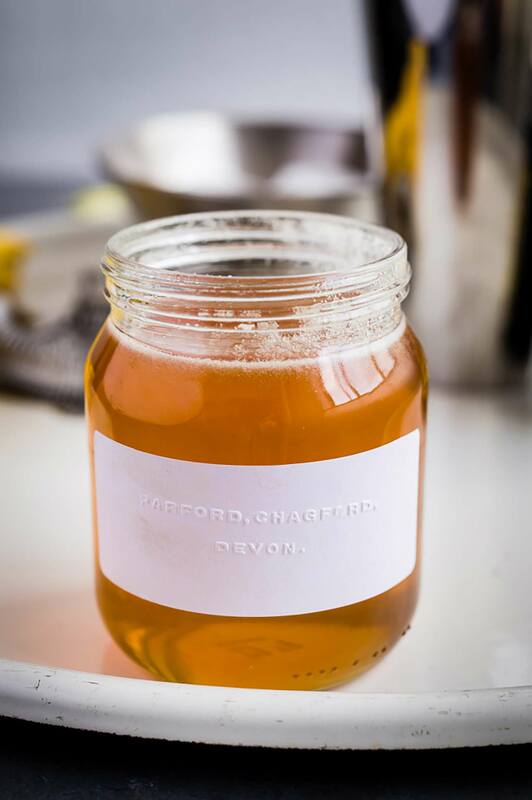 Heather, chestnuts, lime trees and wild flowers; bitterness, acidity or mellow sweetness are just a few of the flavours the foraging bees turn into honey. Likewise with well-made gin, botanicals used in the distillation will be a carefully balanced mixture containing anything from juniper, liquorice, cloves, nutmeg, coriander seeds, rosemary and a limitless list of other herbs, spices and plants. With the rise of new wave micro-distilleries like Sipsmith, Portobello and Jensens, and urban beekeepers like Steve Benbow from London Honey Co. keeping hives throughout the city’s rooftops and parks, the trend for cocktails made with locally sourced ingredients couldn’t have found a better place to thrive. As well as choosing both honey and gin with flavours that I enjoy the most, I try to lay my hands on lemons which have a proper taste to them, beyond jaw-clenching acidity. This is obviously easier in the early summer when the Amalfi ones are available, but the rest of the year I just try to find a good source. Usually the knobblier and larger, the better and always unwaxed and organic. Egg white is not always added to these ‘sour’ style drinks, but I think it’s a great addition. The foam tops the glass and offers a smooth silkiness which rounds the flavours off nicely. The strength of the alcohol and the sharpness of the citrus sometimes just needs to be capped with a lighter top. Jared Brown of Sipsmith taught me something very valuable about shaking cocktails with egg white. Don’t add the ice until after you’ve shaken the liquids. Mix the gin, lemon juice, honey and egg white together and shake well to create the optimum foam, before adding the ice and shaking again. The key is to chill the glass and all the ingredients before serving, then to strain the ice-shaken (or stirred) drink, perfectly chilled, into a chilled glass, rather than serve it over ice, to prevent any unnecessary dilution. After all that, to quote Franklin D. Roosevelt, “I think now would be a good time for a drink”. Something magical happens when the flowery flavours honey and the botanicals of gin combine. Measurements for cocktails should just be a rough guideline; there are so many variables, including which gin or honey you use. It’s all about how strong and sweet you like your drink so have a few tries until you get it just how you like it. Chill a couple of tumblers or your favourite cocktail glasses by filling them to the brim with ice and water and leaving them for a couple of minutes. Put all the other ingredients (without any ice) in a cocktail shaker and shake vigorously. The egg white will become light and foamy. Then add some fresh ice and and shake a few more times. Empty and discard the ice and water that was chilling the glasses and strain the cocktail into them.